Habakkuk saw his people hurting themselves. He begged God to change them - and God said He would... through much discipline and then with great grace. Habakkuk's own faith was put to the test in it all. The brokenness of the world around him, the damaging circumstances crept around his soul. But, in the center of it, he found joy. ...I will take joy in the God of my salvation. The King James version says it like this: I will joy in the God of my salvation. I love that. Joy as a verb. I joy. For me, that has something a little different to it - it's more active than passive. And it makes sense when we look at the Hebrew word: gheel. Here, we literally find the word "spin". Yes, spin. As in twirl around and around 'till your skirt wooshes full. A cake pop dipped in white chocolate, twirled around until it's coated completely. I will spin around in the God of my salvation. Life is hard. Bad things happen. And really bad things happen. And having faith isn't all pretty summer dresses and cake pops. 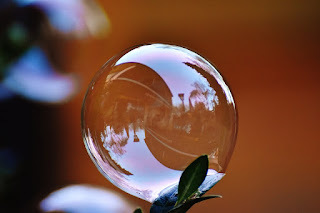 But, picture our hearts and our minds spinning around in God... maybe the little faith we do have is not going to move the situation of our struggle, but maybe it will let us hold on to 2 Corinthians 4. Maybe it will let us keep praying when God is just asking us to wait. Maybe it will allow us to remember everything God has already done for us. I don't think Habakkuk's prayer was flippant. I don't think it was him putting on a mask of, "Everything is just fine and dandy!". Habakkuk's prayer was honest. God - all this yucky stuff is going on. And I'm still going to spin around in You. 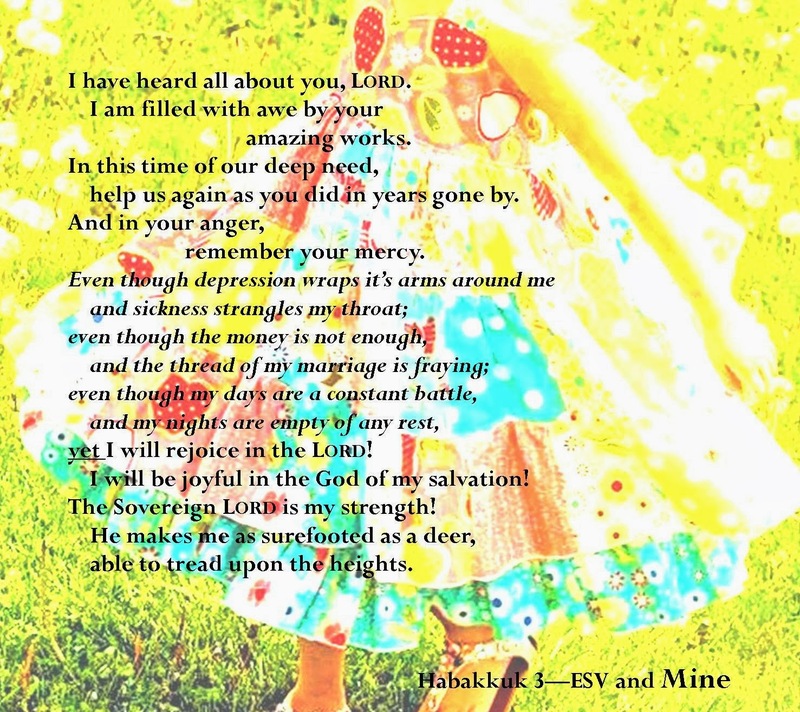 Sometimes I re-write Habakkuk's prayer. I do not have any fig trees - but I do have a ceiling that's leaking and a job that is stressful and loved ones who are fighting great battles. And sometimes the great battles are mine. So, I stuff those in there. Even in the midst of broken circumstances, broken minds, broken bodies, broken love and broken lives, let us joy in You. May we all spin around with abandon.